If vitality and wellness is your goal in your 70s and beyond, then proper nutrition is one of your best allies. As reported in the Journal of Nutrition, researchers at Tufts University have created a senior-specific version of the US Department of Agriculture’s food pyramid, making it easier than ever to achieve your nutritional needs. The Modified MyPyramid for Older Adults graphically highlights the importance of some easy-to-miss nutrients, helping seniors better understand their complex nutritional needs by pointing out several “potential shortfall nutrients” for people over 70. A flag at the top of the pyramid emphasizes that extra calcium, vitamin D, and vitamin B12 might be needed. Calcium—Low-fat dairy and calcium-fortified foods are emphasized as rich sources of this bone-healthy nutrient. Look to fat-free or low-fat milk, low-fat yogurt, and calcium-fortified soy products and orange juice. 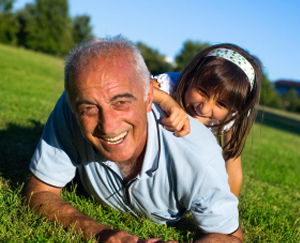 Vitamin D—Most seniors don’t get enough of the sunshine vitamin. The skin’s ability to convert vitamin D to its active form diminishes with age, and many seniors shun the sun for fear of skin damage. Older people can increase their intake by eating vitamin D–fortified foods; some may also need to take a vitamin D supplement. Vitamin E, vitamin K, and potassium—To help decrease the risk of high blood pressure, stroke, cardiovascular disease, and diabetes, the pyramid emphasizes eating a variety of deeply colored fruits and vegetables such as carrots, spinach, and peppers, which are good sources of potassium and vitamins E and K, as well as other protective nutrients. Icons depict bags of frozen veggies that make preparing and storing these foods easier for older people. Canola and soybean oils are also pictured as rich sources of vitamin E and K; saturated and trans fats are discouraged. Fiber—Foods high in fiber tend to be more nutrient-rich. Legumes, whole grains, and fruits and vegetables are great fiber sources. Vitamin B12—Vitamin B12 deficiency becomes more common with increasing age, as many people lose the capacity to produce stomach acid, which is necessary for its absorption. It might be wise to take a B12 supplement or talk with your doctor to determine if B12 injections would be beneficial. Fluids—The “thirsty cues” also diminish with advancing age, leaving seniors vulnerable to dehydration. As a reminder to stay hydrated, the pyramid shows a row of water glasses. A good rule of thumb is to drink eight 8-ounce glasses of water per day. Exercise—The Modified MyPyramid for Older Adults also emphasizes the importance of staying physically active in later years. It is important to consider that while your diet may lack many nutrients, it may be too plentiful in others. With fortification of foods and widespread use of multivitamin preparations, some seniors may get too much folic acid, which can mask the laboratory diagnosis of vitamin B12 deficiency, potentially leading to neurological damage. Many seniors take medications that may be impacted—positively or negatively—by adding supplements to the mix. If this is true for you, look for a healthcare practitioner knowledgeable in nutritional medicine to help you learn about potential drug-nutrient interactions and supplement recommendations that may best support your health.